Years ago, Lupton House used to be a private school. When the school was no more, the buildings lay neglected and had degenerated into ruins. Thankfully, Lupton was taken over by a charitable trust and a restoration programme of the house and gardens began. The entrance drive to Lupton is a fair distance and we found plenty to distract us along the way. We decided to postpone a tour of the listed buildings for another time. Because of scrub clearance (principally rhododendron) there were log piles. And where there are log piles, fungi are sure to be found. 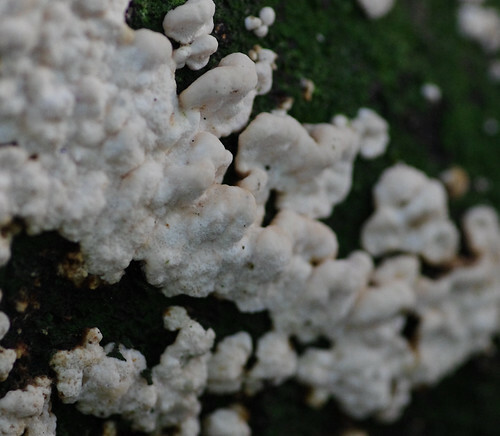 Before any of these there were lichens on the trees still standing. 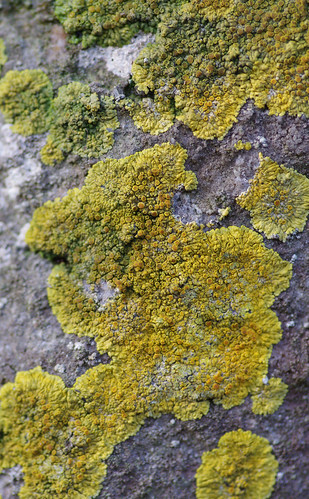 This one (the greenish-grey thallus occupying the central part of the image) has quite a distinctive surface. 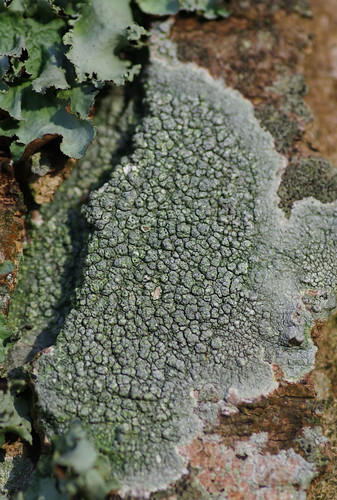 The warty protuberances each have a number of pits and this lichen has been compared to pepper-pots. 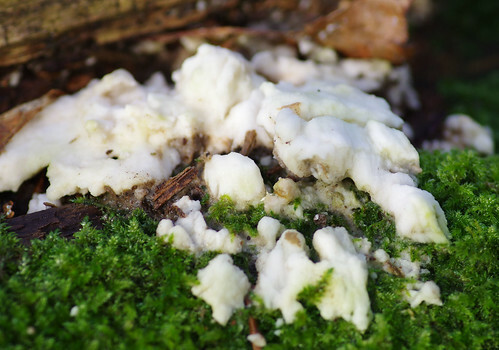 Its foliose neighbour in the top left is probably Parmotrema perlatum. By the side of the drive there were Peziza cup fungi among the bark mulch but they did not want to be captured for posterity, the camera rendering them too bright. We hoped there would be others on our route. Further along the drive we took the permissive path to the left. 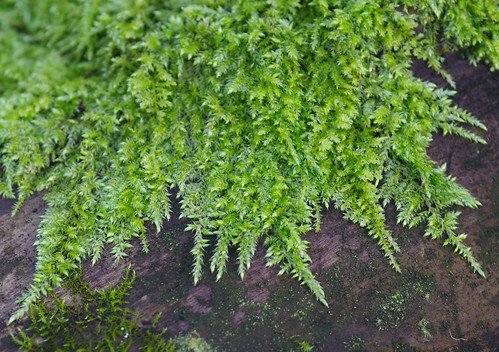 There was a damp stone wall on the left, the ideal place to find (but not necessarily isolate mosses). This is quite a rare species. According to our guidebook it is easily confused with others. Though judging appearances this is by far the closest match. Sherry and I are in agreement here and hopefully it's more a case of 'great minds think alike' rather than a case of mistaken identity. Sometimes just looking is ample consolation for not knowing precisely what things are (particularly when you don't have the right equipment and are overly dependent on the naked eye). 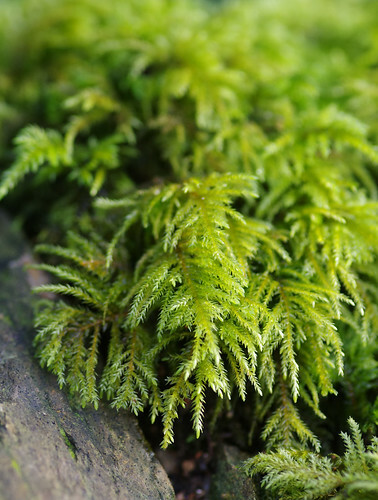 I got the feeling that if we had have stood still long enough, we would have seen the mosses cover the base of the wall, stretch shoots along the ground and over us, too. But these thoughts of idle years soon dissolved, replaced by the need for momentum and change. 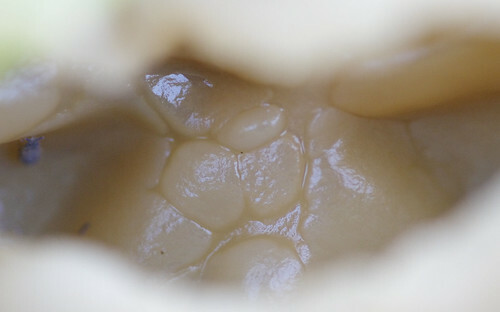 Many bracket fungi are dented all over on their under surface. But these appeared studded with holes above. The fact that they were shiny and smooth-looking only compounded the confusion. 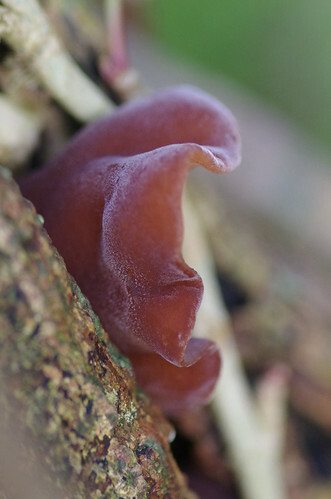 I'm guessing whatever these are they might be young specimens and therefore will become more characteristic of their species over time. 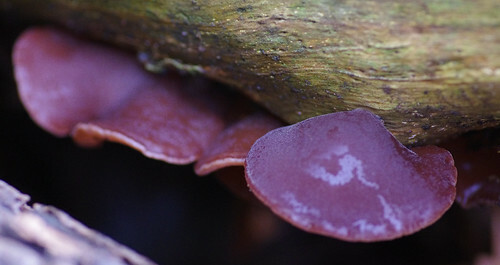 These upright shoots could be Lateral Cryphaea (Cryphaea heteromalla). They match the field guide illustrations and descriptions. But with all these mysteries, even would-be certainties start to look doubtful! There is a faint sprinkling of what appears to be fairy dust on this species. It's confined to the crown above but can be more liberally distributed in other specimens. We saw a handful of more ragged-looking, moth-eaten specimens before settling on the one above. These examples are more purple than those we are used to seeing. By looking at neighbouring logs we were able to find other, more representative samples of the species. The one above is nearer to the typical colour. 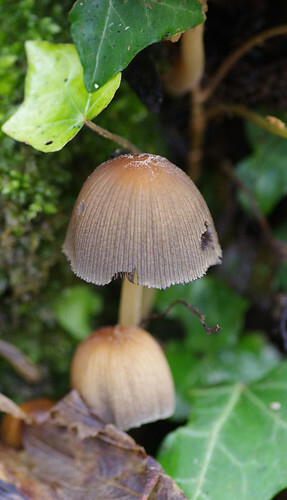 Older specimens are brown and much more wrinkled. They can also possess something resembling a vein on the surface. They can be seen all year round but usually appear at their best during autumn and winter. It's not often we find a perfect match between what we have seen and what experts have seen and chosen to put in a book. The image above is a tad paler than the one in the book but otherwise everything, including the habitat (a bale of straw) was present and correct. This could almost be an image from a surrealist film: a bit unsettling. The camera just picked out the grubby weevil thing to the left of the picture we would undoubtably have missed. If it had been a few degrees colder this might have passed for the last lumps of melting snow. We had looped round along a path and were turning back. With no lunch packed, our sights were firmly set on returning home. 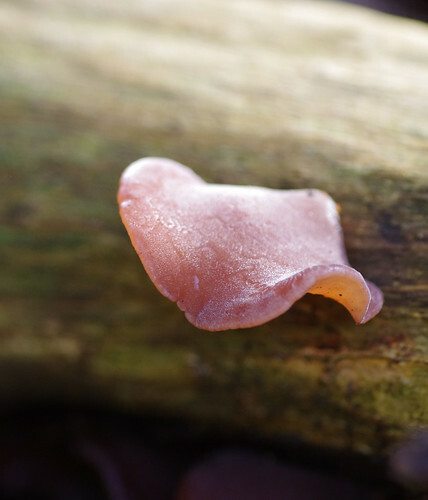 And one last Jelly Ear for luck. These were not clear enough to confirm identification. But at least we know where they are and hopefully will be able to relocate them at a later date, take a spore print and solve another mystery. 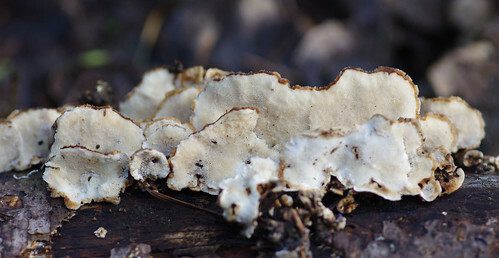 The crimped, burnt-looking edges of these fungi reminded me of crisps. Then again, we hadn't yet eaten lunch. 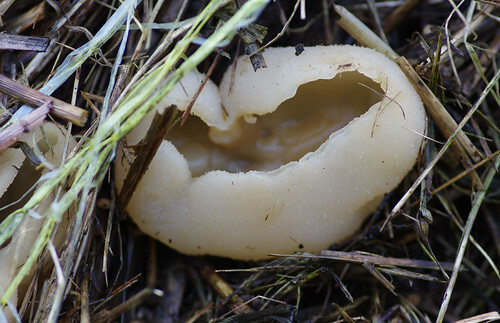 Tripe Fungus can be remarkably similar and also strikingly variable in its mature forms. 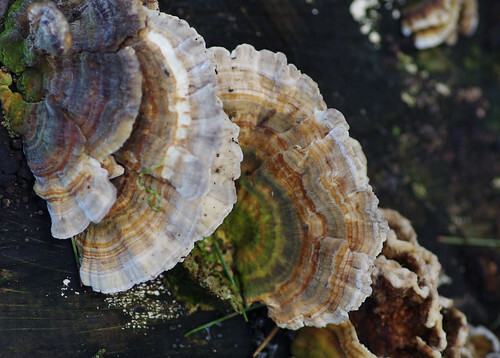 But these have more of the turkey's tail shape and form that gives the species its name. We made haste walking back along the entrance drive. In practically no time at all we had passed the open entrance gates, crossed the busy main road and were walking back towards Churston Village. But in time-honoured tradition there was one last pause to provide a tentative sense of closure. These two specimens were located on a stone wall outside a house. 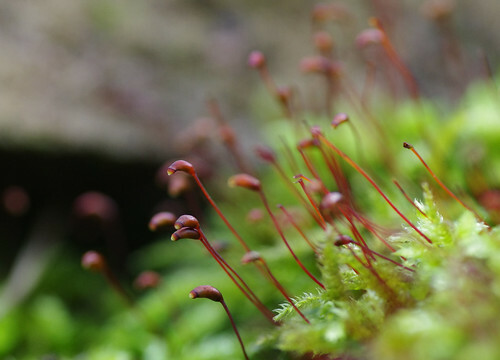 We were procrastinating over this species the previous week, during our Dartington walk. These provided a more extensive patch. The lobes are consistent with textbook examples. 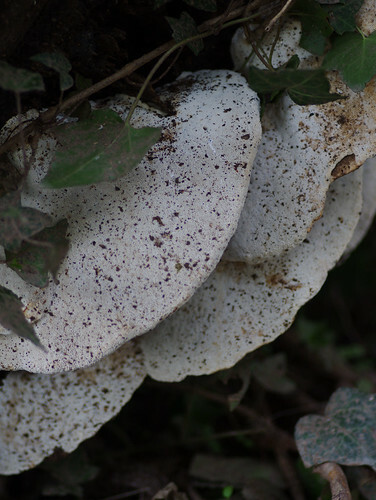 The discs are darker in the centre than at the margins and the thallus also possesses white patches. 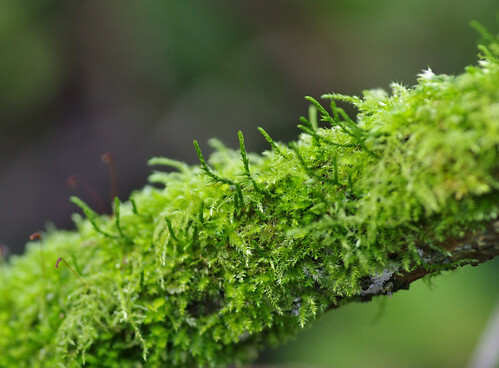 These are different specimens of the same lichen species. 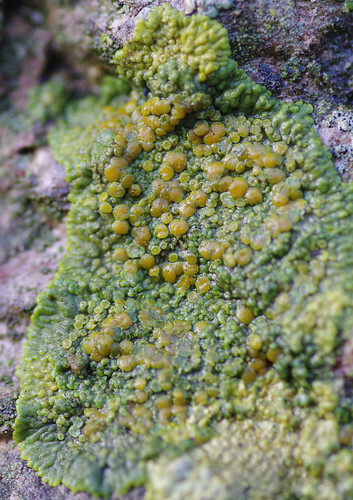 The lower of the two was on a much wetter part of the wall, and consequently the algal cells were more predominant (having turned it a darker green). When wet the discs also appear much altered. Here, they are more convex and sweetcorn-like.